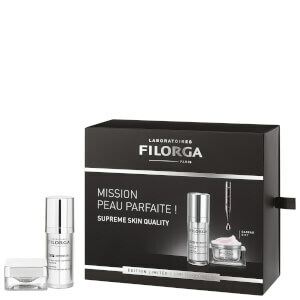 Combat fine lines, wrinkles and unwanted signs of ageing with the Filorga Anti-Wrinkle Night and Day Set; a trio of the brand’s best-selling plumping, firming and retexturising treatments enriched with a combination of natural botanicals and science-based actives. Gentle, yet effective, the set’s contents work in tandem around the clock to deliver hydration to tighten the skin, soften the appearance of unwanted lines and help brighten the complexion for a youthful, rested look. A powerful but harmless skin-resurfacing treatment that works throughout the night when skin is most receptive, to target the appearance of fine lines, wrinkles, dark spots and other signs of ageing. Combining six hydroxy acids for a safe peeling effect, with soothing Brown Algae, the formula contains a brightening plant extract and sebum-regulating complex that work simultaneously to refine pores and leave the complexion matte and luminous in the morning. An innovative treatment that utilises a powerful peptide and a botox-like active ingredient to reveal a smoother, more refined eye contour. Fortified with unique plumping spheres, the lightweight, quick-absorbing formula helps to minimise the appearance of expression lines, wrinkles and under-eye hollows, whilst fading dark circles and combating uneven skin tone to restore youthful luminosity. Its lifting complex fights sagging of the upper eyelids and boosts the volume of lashes for wider-looking eyes. Time Filler: Apply morning and/or evening to the face, neck and décolleté, after first washing thoroughly. Apply directly to the skin or over serum. All you need is a tiny quantity of this highly concentrated product. Ideal makeup foundation. Sleep and Peel: Apply at night on a clean face, every day or alternate every 2 days, for the most sensitive skins. Slight tingling after application means the anti-aging ingredients are working. Time Filler Eyes: Apply the treatment every morning and/or evening. A small amount will suffice. Dot gently around the contours of the eye, taking care not to forget the upper eyelid and the root of the lashes. Time Filler: Aqua (Water), Glycerin, Butylene Glycol, Dicaprylyl Carbonate, Isododecane, Hydroxyethyl Acrylate/Sodium Acryloyldimethyl Taurate Copolymer, Squalane, Methyl Methacrylate Crosspolymer, Cetearyl Isononanoate, Imperata Cylindrica Root Extract, Dimethicone, Dimethicone/Bis-Isobutyl Ppg-20 Crosspolymer, Orbignya Oleifera Seed Oil, Sucrose Palmitate, Parfum (Fragrance), Phenoxyethanol, 1,2-Hexanediol, Propanediol, Stearalkonium Hectorite, Glyceryl Linoleate, Peg-60 Hydrogenated Castor Oil, Caprylic/Capric Triglyceride, Tocopheryl Acetate, Chlorphenesin, Propylene Carbonate, Xanthan Gum, Polysorbate 60, Sorbitan Isostearate, Prunus Amygdalus Dulcis (Sweet Almond) Oil, Sodium Chloride, Biosaccharide Gum-1, Silica, Hydrogenated Vegetable Oil, Hydroxypropyl Cyclodextrin, Sodium Levulinate, Caprylyl Glycol, Sodium Hyaluronate, Citric Acid, Carbomer, Dipeptide Diaminobutyrol Benzylamide Diacetate, Glyceryl Caprylate, Potassium Sorbate, Sodium Citrate, Crithmum Maritimum Extract, Glucose, Sodium Anisate, Potassium Chloride, Calcium Chloride, Acrylates/C10-30 Alkyl Acrylate Crosspolymer, Magnesium Sulfate, Glutamine, Sodium Phosphate, Tocopherol, Palmitoyl Tripeptide-38, Ascorbic Acid, Sodium Acetate, Lysine Hcl, Arginine, Alanine, Histidine, Valine, Leucine, Threonine, Isoleucine, Tryptophan, Phenylalanine, Tyrosine, Glycine, Polysorbate 80, Serine, Deoxyadenosine, Cystine, Cyanocobalamin, Deoxycytidine, Deoxyguanosine, Deoxythymidine, Glutathione, Asparagine, Aspartic Acid, Ornithine, Glutamic Acid, Nicotinamide Adenine Dinucleotide, Proline, Aminobutyric Acid, Methionine, Taurine, Hydroxyproline, Glucosamine, Coenzyme A, Glucuronolactone, Sodium Glucuronate, Thiamine Diphosphate, Disodium Flavine Adenine Dinucleotide, Sodium Uridine Triphosphate, Tocopheryl Phosphate, Retinyl Acetate, Inositol, Methyl Deoxycytidine, Niacin, Niacinamide, Pyridoxal 5-Phosphate, Pyridoxine Hcl, Biotin, Calcium Pantothenate, Folic Acid, Riboflavin. Sleep and Peel: Aqua (Water), Glycolic Acid, Propylene Glycol Dicaprylate / Dicaprate, Cetearyl Alcohol, Cyclopentasiloxane, Glycol Palmitate, Glyceryl Stearate, Peg-100 Stearate, Glycerin, Isononyl Isononanoate, Cyclohexasiloxane, Sodium Hydroxide, Glyceryl Undecylenate, Butylene Glycol, Caprylic / Capric Triglyceride, Phenoxyethanol, Ceteareth 20, Triticum Aestivum Seed Extract, Sucrose Palmitate, Parfum (Fragrance), Aloe Barbadensis Leaf Juice Powder, Tocopheryl Acetate, Disodium Edta, Lactic Acid, Glyceryl Linoleate, Azelaic Acid, Prunus Amygdalus Dulcis (Sweet Almond) Oil, Sodium Chloride, Laminaria Ochroleuca Extract, Salicylic Acid, Carbomer, Lecithin, Polysorbate-20, Chondrus Crispus Extract, Malic Acid, Caprylyl Glycol, Glucose, Sodium Hyaluronate, Citric Acid, Xanthan Gum, Potassium Chloride, Potassium Sorbate, Calcium Chloride, Atelocollagen, Hexylene Glycol, Magnesium Sulfate, Glutamine, Pyruvic Acid, Sodium Phosphate, Sodium Chondroitin Sulfate, Ascorbic Acid, Sodium Acetate, Palmitoyl Oligopeptide, Tocopherol, Lysine Hcl, Arginine, Alanine, Histidine, Valine, Palmitoyl Tetrapeptide-7, Leucine, Threonine, Isoleucine, Tryptophan, Phenylalanine, Tyrosine, Glycine, Polysorbate 80, Serine, Deoxyadenosine, Cystine, Cyanocobalamin, Deoxycytidine, Deoxyguanosine, Deoxythymidine, Glutathione, Asparagine, Aspartic Acid, Ornithine, Glutamic Acid, Nicotinamide Adenine Dinucleotide, Proline, Aminobutyric Acid, Methionine, Taurine, Hydroxyproline, Glucosamine, Coenzyme A, Glucuronolactone, Sodium Glucuronate, Thiamine Diphosphate, Disodium Flavine Adenine Dinucleotide, Sodium Uridine Triphosphate, Retinyl Acetate, Inositol, Methyl Deoxycytidine, Niacin, Niacinamide, Pyridoxal 5-Phosphate, Pyridoxine Hcl, Biotin, Calcium Pantothenate, Folic Acid, Riboflavin, Tocopheryl Phosphate. Time Filler Eyes: Aqua (Water), Glycerin, Propanediol, Caprylic / Capric Triglyceride, C12-16 Alcohols, Squalane, Ethylhexyl Palmitate, Albizia Julibrissin Bark Extract, Benzyl Alcohol, Isododecane, Hydrogenated Lecithin, Palmitic Acid, Sodium Polyacrylate Starch, Glyceryl Stearate, Peg-100 Stearate, Sucrose Palmitate, Polyacrylate-13, Behenyl Beeswax, Hydrogenated Polydecene, Stearyl Beeswax, Chlorphenesin, Disodium Edta, Parfum (Fragrance), Polyisobutene, Glyceryl Linoleate, Prunus Amygdalus Dulcis (Sweet Almond) Oil, Sodium Chloride, Ci 77891 (Titanium Dioxide), Hydrogenated Vegetable Oil, Sodium Hydroxide, Mica, Trihydroxystearin, Polysorbate 20, Hydroxypropyl Cyclodextrin, Sorbitan Isostearate, Silica, Sodium Hyaluronate, Dipeptide Diaminobutyroyl Benzylamide Diacetate, Panthenol, Crithmum Maritimum Extract, Glucose, Phenoxyethanol, Biotinoyl Tripeptide-1, Citric Acid, Sodium Benzoate, Potassium Chloride, Potassium Sorbate, Calcium Chloride, Darutoside, Magnesium Sulfate, Glutamine, Sodium Phosphate, Palmitoyl Tripeptide-38, Ascorbic Acid, Sodium Acetate, Tocopherol, Lysine Hcl, Arginine, Alanine, Histidine, Valine, Leucine, Threonine, Isoleucine, Tryptophan, Phenylalanine, Tyrosine, Glycine, Polysorbate 80, Glucomannan, Serine, Deoxyadenosine, Cystine, Glutathione, Cyanocobalamin, Deoxycytidine, Deoxyguanosine, Deoxythymidine, Asparagine, Aspartic Acid, Ornithine, Glutamic Acid, Nicotinamide Adenine Dinucleotide, Proline, Aminobutyric Acid, Methionine, Taurine, Hydroxyproline, Glucosamine, Coenzyme A, Glucuronolactone, Sodium Glucuronate, Sodium Uridine Triphosphate, Thiamine Diphosphate, Disodium Flavine Adenine Dinucleotide, Retinyl Acetate, Inositol, Methyl Deoxycytidine, Niacin, Niacinamide, Pyridoxal 5-Phosphate, Pyridoxine Hcl, Biotin, Calcium Pantothenate, Folic Acid, Riboflavin, Tocopheryl Phosphate.